The world is sorely lacking in Wes Anderson-themed Lego sets. We’ve seen the Back To The Future Lego set, the Ghostbusters Lego set, Lego versions of The Simpsons, and even an unofficial Lego Breaking Bad. Wouldn’t it be cool to add a tiny model of the Tenenbaums’ house to that collection? Or maybe Steve Zissou’s helicopter, complete with a dying Owen Wilson minifigure? Finally, a team of Lego/Wes Anderson nerds has come through to fill this gaping hole in our lives that we didn’t notice was there until just now. 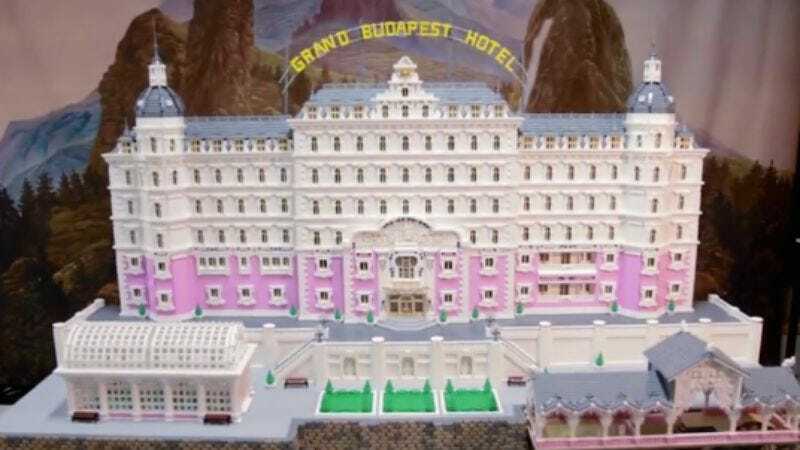 Created to promote the DVD/Blu-Ray release of Anderson’s latest charming quirk-fest, a group of nine Lego architects built a scale replica of The Grand Budapest Hotel’s titular hotel. According to Collider, the build took 575 hours and 50,000 Lego bricks. The completed model reportedly weighs 150 pounds and is seven feet tall. Of course, since this project was all custom built and designed, it’s not the sort of thing anyone can run out to the store and buy. That means the world is technically just as lacking in Wes Anderson-themed Lego sets as it was at the beginning of this article, but it’s still pretty cool. Anyone out there who wants to make their own Grand Budapest Hotel—or anyone who’s just curious about how it was done—can check out the video below.